From the time I grew up, started working, and got married, my slow cooker became my appliance of preference for food prep. If you could see the first crockpot cookbook I got (as a wedding shower gift...thank you, Krista) with its splattered and crumpled pages, you would know immediately how much I love a slow cooker. I was happy to agree when Calisto Publisher offered to send me this book. 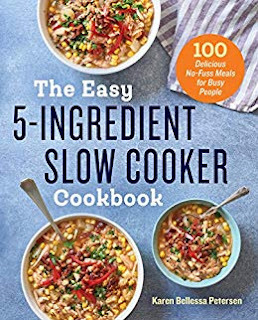 I am glad to tell you that The Easy 5-Ingredient Slow Cooker Cookbook is everything you want in a slow cooker cookbook. The author, Karen Bellessa Petersen, is a busy mom herself, and she has learned the many values of a slow cooker. Petersen has included only recipes that contain only five primary ingredients, though the recipes may also include a few pantry staples and simple spices. Each recipe is meant to be a complete meal. The recipes require no more than fifteen minutes of preparation time. The recipes cook for eight hours, the time one is generally away from home. There are no processed foods used in the recipes. 1. Put the corn in the slow cooker. Sprinkle in the salt, pepper, and cumin. Pour in the broth and the picante sauce. Submerge the potatoes in the liquid. Nestle the chicken thighs in among the potatoes. 3. Transfer the chicken to a cutting board. The meat should practically fall off the bones. Discard the cartilage and bones. Shred the chicken with two forks and return it to the slow cooker. 4. Transfer the potatoes to the cutting board. Smash two of the potatoes with a fork and stir into the slow cooker. Cut the remaining two potatoes into cubes. Gently stir the cubed potatoes and lime juice into the slow cooker. Season with additional salt and pepper, if desired. Ladle the soup into bowls and serve. Like you, I've been a slow-cooker fan for a long time. I can't remember if the current one is my second or third one, but they do wear out eventually. At the beginning, I had a book or two on how to use them, but over time I figured out how to adapt recipes that I liked: obviously, not just any recipes, but ones that required long cooking times to tenderize foods and meld flavors. Maybe I need another book by now. I don't use my slow cooker enough. I got one slow cooker cookbook and the prep time was outrageous so I never use it. I like the fact that this one has quick prep times. I'm going to check it out. I love the idea of 8-hr recipes. I always wonder how useful the slow cooker is to people who work outside the home, when the directions call for 4 or 5 hours. This sounds like a winner. YES! This is exactly the kind of cookbook I need. I’m always looking for yummy things that don’t require me to be in the kitchen all day. Love my slow cooker too. Been looking for more slow cooker recipes. Thanks for featuring this cookbook! The corn chowder recipe looks delicious and perfect for a cold snowy day. I'm pretty sure we have all the ingredients--in the freezer or in the pantry--so we wouldn't even have to venture out to make it. The corn chowder sounds amazing, will have to give it a try in my instapot. Would make a nice change from the barley soup I like to make. That looks yummy! I like that the recipes require little preparation and not a lot of ingredients. We just got an Instant Pot late last year and are really enjoying it. 8 hours! that's really slow. I am more a pressure cooker person, get a meal from the scratch in 15 min. :-). I just love love love my slow cooker. The best part is the sounds of enjoyment coming from my family as they eat!